The Machine begins to swallow Dice-K - Cursed To First - Sox and Pats forever. "Daisuke sits on the disabled list for the fifth time in two seasons," wrote Passan. Among his shoulder, elbow and forearm, he’s faced problems with every part of his arm. The only thing left is his hand, and as many times as he’s raised a figurative middle finger at the organization, it’s a shock he hasn’t hurt that, too. 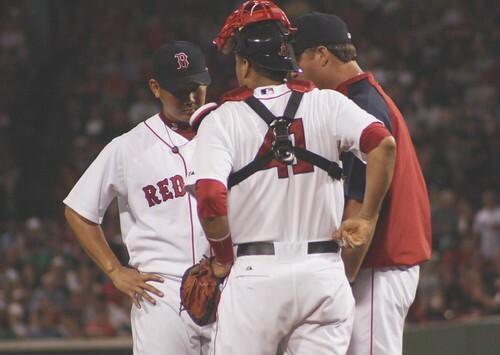 Matsuzaka’s tack with the Red Sox, according to sources inside and outside the organization, has been simple: Ignore what they want and do what he wants. There they are again, those "sources inside the organization". They're like the shadowy demons in the movie Ghost, rising up to drag underperforming players into the purgatory of ruined reputations. We saw them take hold of Nomar in 2004, when no sooner had Sox fans wrapped their heads around his trade-deadline exit than we were hearing that the beloved shortstop was "not our friend." More tellingly, we saw an attempt at this type of campaign, also headed by an anonymous "source inside the organization" levied unsuccessfully at Theo Epstein during his contract saga in 2005, in the form of the CHB's now-infamous "Let's iron out some of this dirty laundry," column. The beat went on even after l'affaire Theo backfired; Manny Ramirez was the latest example of this Machine in full gear. I'm not saying the decision to get rid of Manny was the wrong one, but I have yet to hear a satisfactory explanation for why the public even knows about him shoving the traveling secretary (a tidbit also leaked by "sources inside the organization"), unless it was about the "optics" of getting rid of one of the franchise's most popular players. When Boston dropped a $51.1 million bid for the rights to negotiate with Matsuzaka, then in late 2006 handed him a six-year, $52 million contract, they expected an ace. They got an ACE: Another Chubby Easterner, Hideki Irabu 2.0, a disappointment, a waste of money. Just how big of one is the question with Daisuke. He arrived at his first spring training sporting a healthy gut, and his stark refusal to get, let alone stay, in shape has colored his tenure with Boston. The Red Sox’s front office wouldn’t be nearly as concerned with Matsuzaka’s physique if his arm weren’t horrifically abused during his time in Japan. Matsuzaka believes his throwing program in Japan was just fine and Boston has been too restrictive, and that conflict set the backdrop for the rest of their relationship. In other words, what we've got here is a failure to communicate. A cultural divide too wide to cross. An prideful individual transplanted from a fishbowl where he was considered a god to a fishbowl where he's considered a bum. There are many ways that story can be told, spun, phrased. This kind of piece could just as easily take a navel-gazing look at the cultural differences between the style of game played in the US and the type favored in Japan; this could easily be a story about how few Japanese players have reached the status of an Ichiro or even Hideo Nomo playing in MLB, and why that might be. When it comes to Daisuke in particular, I've always wondered, for example, how the different size of baseball in the American game has affected his pitch delivery -- to me, especially now, it seems like it can't not have affected it. Not to mention how the culture shock off the field might have affected him, too. And by now it seems clear that the differences between his training regimen in Japan and in the US (whether you want to call his routine in Japan, in a six-man rotation, "horrific abuse" or not) has also affected him to the point of damaging the instrument -- his arm -- that is his livelihood. The most cynical depths of my reptilian brain can almost understand the anonymously-sourced attacks on players like Nomar and Manny, or during the conflict with Theo. Without the information leaked out about their private bad behavior, there was a danger, for the organization, that fan loyalty would side with the individual rather than the laundry. They can't have that -- bad for business. So under the bus those departures went. But in this case, I just don't understand what it accomplishes, even cynically, to publicly call out Daisuke as a stubborn, pigheaded, lazy diva as soon as it becomes obvious his days in Red Sox uniform are numbered. Few fans in Boston are likely to object to him being given the boot; this kind of over-explanation is hardly necessary for them. Meanwhile, the cash dropped on the negotiating rights with Daisuke, as well as the hefty contract for this "national treasure," were justified as a means of bringing a new Japanese audience into the Red Sox fold. Exactly how does slapping that "lazy diva" label on him five years later going to play with an audience for whom he was a national hero before he ever left for the big leagues? Will it really ensure that their loyalty remains with the laundry? Somehow, I highly doubt it. Or, in this instance, is the Machine awakening simply to defend the decision to sign Daisuke in the first place, and to defer any blame that might be levied against the organization for the failure of that decision back onto the fallen star? Does the front office believe Sox fans don't understand the basics of this situation? Does it not trust them to come to their own conclusions about what happened with Daisuke? No matter how badly Daisuke performed (and don't get me wrong, he has performed badly -- when he's even shown up), this pattern of aspersions cast from the front office onto high-profile "busts" as soon as the door closes behind them is beginning to reflect poorly on the Red Sox as an organization, at least in this one fan's opinion, regardless of who's "right." With the recent injury... what CAN we do? You hit the nail right on the head. The dreaded "sources" quotes are the beginning of the end. However, in this case I don't think they need it--DK did all the smearing needed all on his own. Dice-K had that really good 18-3 season, but then the next spring (I think) was the World Series of Countries. Dice-K was great for Japan, but never again pitched well for the Sox. Just like Mike Timlin did something to his arm, pitching too much, too early in the spring. I think maybe if there hadn't been that Spring competition among countries, Dice-K might have lived up to his billing and salary.